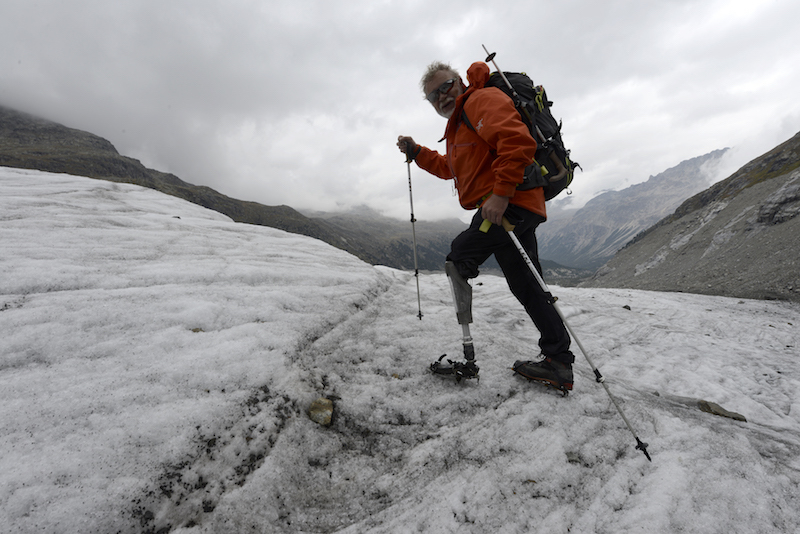 Rey "Reto" Keller seen here climbing the Morteratsch Glacier in 2016, prosthetic and all. Rey Keller photo. If you were born a boy in the Swiss mountains during the 1950s, chances are high you had dreams of becoming a mountain guide. Rey “Reto” Keller was one of those young boys with aspirations of one day guiding, growing up in the lower part of the Engadin Valley in a multi-generational family of guides. “Guiding was part of our family. As a boy, you had a stamp on your forehead when you were little–you were becoming a guide. It was kinda mandatory and traditional,” says Keller. But Keller is far from your run-of-the-mill Swiss guide. “I was lucky because I learned lots of things from the really, really old guides–combined with what we know now–so I came out to be a little bit different than a modern guide,” Keller says. Coming to Canada was a joke. Keller and his ex-wife Angie were working together in Switzerland in a kitchen at the time. Although Keller was a certified IFMGA (International Federation of Mountain Guide Associations) guide, European guides also had to have a “backup” profession, and Keller’s was being a chef. Keller and Angie saw an ad in the local Swiss paper for a chef's job at the Mount Engadin Lodge and ironically decided to send off applications for the gig, with the punchline being that this Mount Engadine Lodge was actually located in Canmore, Canada not Switzerland. As luck would have it, they got the job–and after doing a season cooking in the Great White North at the Mount Engadine Lodge, the Kellers were hooked on Canada. Keller soon picked up the first guiding position at Island Lake cat skiing. Keller was a fixture at Island Lake for over a decade. He did safety on some of the first TGR films shot there and also became a mentor to many young guides. Keller guiding on the Pers Glacier in Switzerland in 1982. Rey Keller photo. Although he had a big presence in the mechanized skiing world, his real passion was for cross-country skiing. “I grew up on cross-country skis, I used to ski to school,” says Keller. Keller’s prime coincided with the ‘80s heyday of niche ways to climb in the Himalayas. Keller was sponsored by Adidas and would do big expeditions. In 1987, he did the first cross-country expedition in the Himalayas, but on the way out he had a bad crash. Keller was brought back to Europe and when the doctors operated on Keller’s knee, they found that he had bone cancer, making this unfortunate event more drastic. It's also likely that it saved him from a worse fate. The damage to left leg was so severe that his doctors recommended that he remove it immediately. But Keller had that one quality many a mountain guide has in spades–stubborn, dogged determination–so he waited 15 years before listening to doctors. Keller showing off his prosthetic (which he MacGyvered with a $10 rubber ski strap) that carried him through his Greenland journey last year. Rey Keller photo. Like many younger guides coming up, Knechtel learned from Keller. Growing up, Keller always wanted his second job to be a carpenter not a chef. Keller’s carving skills were engraved (no pun) since birth: Keller’s grandaunt Hanna Wörth was a famous carver in Germany and taught Keller as a child. While his family pushed him in the direction of cooking professionally, he always fostered his love for carpentry and carving, and still creates for Hazelnut Art. Keller’s pieces all have a distinct style that reveals his personality–whimsical, precise and sturdy. He has always worked “Reto” style. Keller's pipe is ubiquitous–he even puffs on it while skiing downhill. Rey Keller photo. Keller’s beard (which earned him the nickname Yeti) and his pipe have become his symbols. “He would always be skiing with a pipe in his mouth–he would literally be smoking down the whole run, it was hysterical,” says Knechtel. In 2003, Keller finally let his leg be removed. Nine months later he climbed Hai Ling, the iconic peak that overlooks Canmore. Keller's love of his pipe started at a young age–here he is with one at four years old alongside his sister. Rey Keller photo. Keller went back to Europe in part to get a better prosthetic. He eventually found Össur, the Icelandic company founded by prosthetist Össur Kristinsson which is considered the leader in modern-day prosthetics. 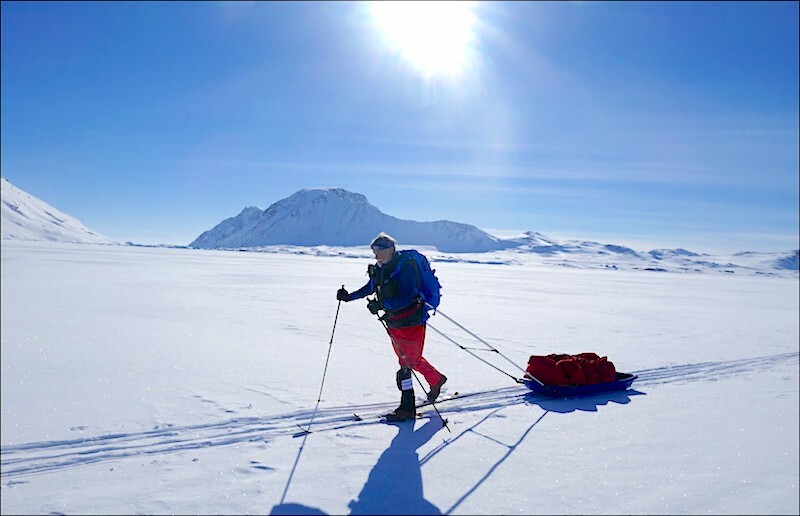 Last year, Keller became the first amputee wearing a prosthesis to cross-country ski across the Greenland glacier, over 150 kilometers. In true “Reto” style, Keller used a $10 rubber G3 ski strap to modify his $50,000 digital prosthetic leg. “I made it possible so I can ski tour, cross-county ski and backcountry. I just made a patellar ligament with a G3 strap,” says Keller nonchalantly. He did the same with 8 other amputees’ prosthetics so they could ski on a recent trip. Keller seen climbing Piz Kesch in 2017, and repping Össu. Rey Keller photo. Keller currently lives in Carerra, Switzerland with his partner Rea and continues to make furniture and carve. He also travels around doing motivational speaking for various groups. His latest projects are ice climbing on Piz Palü and climbing the north ridge of Piz Badile a 3,308-meter tall mountain in Switzerland, both objectives that would be considered fairly impressive for an able-bodied climber in their primes, let alone a nearly 70-year-old amputee. Keller’s passion for life, the mountains, art and friends is evident to everyone he interacts with. His perseverance is boundless. If the world only had more Retos, it might be a better place. This is big inspiration. People like this makes normal people who are healthy and has no such difficulties like this inspired and question themselves about their whining over loss on small subjects. I respect this man for what he is doing and his strong will.